…as young Skywalker wielded his weapon, Damien unsheathed his sword. The echoes of steel on laser would be heard for generations to come. Therefore when you see the Abomination of Desolation which was spoken of through Daniel the prophet, standing in the holy place (let the reader understand), then those who are in Judea must flee to the mountains (Matthew 24:15-16). I’ve been encouraged recently by more than one to allow the Scriptures to interpret themselves… such as keeping the context of the entire Bible in focus when grasping ‘what does it say’? So what did others say of this event? Notice, the immediate text references Daniel. What did he say? He said that there was one coming on the wings of abomination who would put an end to sacrifices and cause desolation (Daniel 9:27). What about the other accounts of the gospel? Did any of these writers acknowledge anything pertaining to these words found in Matthew? Yes! The twenty-first chapter of Luke presents his take on this day of teaching in the lives of Jesus’ disciples. But when you see Jerusalem surrounded by armies, then recognize that her desolation is near. 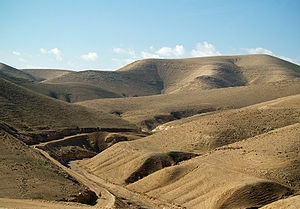 Then those who are in Judea must flee to the mountains… (Luke 21:20-21). Then is there an event in the history of these people (within the generation Jesus spoke to – verse 34) that meets the requirements of this prophecy? It sure sounds an awful lot like Titus’ invasion and destruction of the Temple in A.D. 70. What say you? This entry was posted in WordPosts and tagged Abomination of Desolation, Christianity, Daniel, destruction of the Temple, end times fiction, faith, Jerusalem, Judea, realized eschatology, the antichrist. Bookmark the permalink. We have solid evidence that Messianic Jewish believers understood the first Roman advance as a time to pack up and go, because they remembered and took to heart the Lord’s prophecy. Many relocated to Pella. The unbelieving Jews fought it out and lost out. Thanks for the post, Mike. I agree with you very much about the desolation of which Jesus warned his followers occurring in 70 A.D. However, we are seeing political scientists and statesman now declaring that the days of Israel as a state are numbered (largely due to the threats from Iran!) Much to pray over, I would say. Interesting…this is the exact scripture that was on my heart this morning, so I was studying the same passages. And I would agree this is related to after the 2nd temple is built. I think we are now in the time of the Great Falling Away…which seems to take place before these other events unfold. Great stuff – yeah you have the two messing around each other. Your New Testament stuff is right on and the fulfillment is right on, but Daniel is way ahead of this time line. His prophecy will be related to the beginning of temple sacrifices once again. Since there is no temple – wait for it to be built and then wait for the abomination. The abomination will be conducted by the anti-christ and his identity will no longer be a secret by then.